A solid sales pipeline goes a long way. To make the most of the CRM, you ought to have a customized sales pipeline. You may have thousands of prospective customers, but unless you build clear sales stages, you won’t capitalize on them. How can you accomplish that? For starters, you may build stages for your sales cycle. A solid sale pipeline might goes like this: qualified to buy -> presentation scheduled –> appointment scheduled –> invoice sent -> called for confirmation –> won or lost. It’s very important to attach a percentage to each of the sales stages because you need a clear picture of the overall sales pipeline. 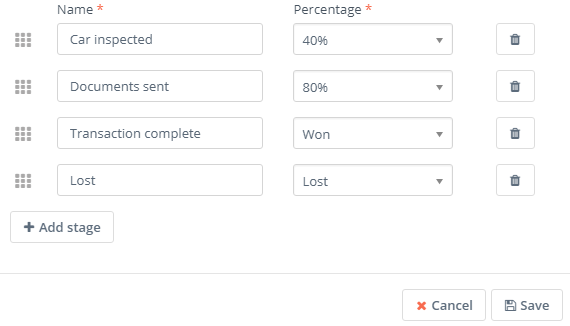 What is more, by attaching percentages to each of the stages you can focus on the right leads. Building stages for deals is of paramount importance for every organization because it not only allows them to manage their leads effectively, but it also helps them make sales predictions based on their interaction with prospective customers. For concrete examples and to know more about the importance of deal stages, please check our resource page.